Following up Bluefin Tamashii’s other excellent exclusives for this year’s San Diego Comic Con, they are also teasing an exclusive 2-pack exclusive from Pacific Rim Uprising! 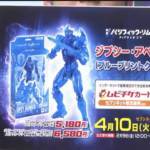 While Bluefin promises more information is coming soon, we can already see from the preview image of this set, that it features re-releases of the popular Robot Spirits Obsidian Fury & Gypsy Avenger. However this go around they appear to be repainted in far more accurate detail, calling back to the Premium Color repaints other Tamashii lines (like Dragonball) have received over the years. We don’t have information on the pricing of this set yet, but it will most certainly be available at the Bluefin Brands booth as with their other exclusives, the SOC Black Megazord & Helmetless MMPR Figuarts. In the 5 years since Pacific Rim first rampaged it’s way across theater screens, fans have been rabid for a sequel to this giant robot love letter. Meanwhile collector’s have been desperately hoping a better option for merchandise and collectibles for the franchise. Well Tamashii Nations has finally come to rescue to provide fantastic action figures and toys at multiple price points and functionality from Pacific Rim Uprising! Today we’re taking a look at the very first release in their Pacific Rim Robot Spirits (Damashii) line with Gypsy Avenger! Kicking the line off in fantastic fashion, is the heroic mech central to Uprising’s plot, Gypsy Avenger. The slimmed down successor to Gypsy Danger, Avenger comes to us at an insanely affordable price point (only $20!) and is one of the best and most functional figures we could hope for at that price. Armed with her Gravity Sling & Chain Sword, Gypsy Avenger can go toe to toe with the toughest Kaiju, giant robots, or otherwise huge heroes in your collection. We’ve attached the full 70 image gallery of Robot Spirits Gypsy Avenger to this post. You can also read our extensive (and positive) review of the figure by clicking “Discuss on the TokuNation Forums” at the bottom of this post. And, we’re gonna continue to cancel the apocalypse off and on for the next month as we review the other 5 Pacfic Rim Robot Spirits that make up the rest of waves 1 & 2! 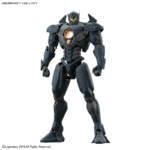 For those that may enjoy a little DIY in their hobbies, Pacific Rim Uprising is the latest series to join Bandai’s fantastic line of High Grade 1/144 model kits, with the latest images and release info having been released for High-Grade Gypsy Avenger, Obsidian Fury, and Bracer Phoenix the first three Jaegers to receive this treatment. All three will be available for purchase in March 2018. Gypsy will cost 2,052 yen while Obsidian and Bracer will cost 2,484 yen each. A DX version of Gypsy will also be available for 3,024 yen this package will include a personalized display base and a LED unit also to be released in March. These three kits should provide a good alternative for those that can’t afford to buy the Robot Damashii versions of these designs. Robot Damashii Pacific Rim Uprising Gypsy Avenger, Bracer Phoenix, Titan Redeemer Available for Pre-Order! Don’t let the SDCC news & reveals be the only thing to whet your Toku appetite! Surprisingly, Amazon has just released some official images and release information for three upcoming releases from Pacific Rim Uprising! Joining the Robot Damashii line are the Gypsy Avenger, Bracer Phoenix & Titan Redeemer Jaegers! This early batch of pre-orders has actually beaten the Tamashii Nations website to the punch, they aren’t even listed there yer. So there are sure to be more official images coming. For now check out what we can see, and maybe take up that early pre-order. 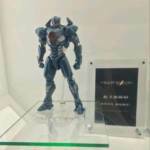 Tamashii Nations Shanghai: Pacific Rim 2 Robot Damashii Gypsy Avenger Revealed! Tamashii Nations Shanghai is in full swing! You may recall that a couple months back we heard our first confirmation that Bandai/Tamashii Nations had finally acquired the license to produce toys for the Pacific Rim franchise. At the time the only offering previewed was a rough prototype of the Soul of Chogokin Gypsy Danger. But as of today we can get excited about one more upcoming product as well! Shown off for the first time is the brand new Robot Damashii Gypsy Avenger from Pacific Rim 2! This successor to the original Gypsy Danger, piloted by the son of Stacker Pentecost, is so far the first product revealed for the highly anticipated sequel. But we’re sure it’s far form the last. For now this release doesn’t have any confirmed release details this far out from the films release on February 23rd, 2018, but we’ll certainly keep you updated as more details become available this year! Now, let’s cancel the apocalypse!